One lawmaker, Republican Assemblyman Ron Castorina, Jr. was so disgusted that during the debate, he declared that his enlightened, politically correct colleagues had actually just voted to codify “African American genocide.” Of course, abortion advocates did not take kindly to the suggestion that they might not have the moral high ground on race relations. Not kindly at all. Castorina has not backed down amid the ensuing media furor, and pro-life leader Dr. Alveda King, niece of Martin Luther King, Jr., applauded his remarks for “speaking this truth to members of the Assembly who clearly could not bear to hear it.” But if you thought a black leader who knew one of history’s greatest civil rights heroes better than almost anyone alive today would stop pro-aborts from claiming to speak for black America, think again. So his whiteness makes him unfit to raise the issue, but yours isn’t a hindrance to condemning his argument? If you were debating the issue with King or other black pro-lifers like Pastor Clenard Childress, Ryan Bomberger, Stacey Dash, or Sheriff David Clarke, would you being the one “whitegirlsplaining” make you automatically wrong? Assemblyman Ron Castorina, Jr. pointed to a report asserting that 15 million African Americans have been “murdered” (sigh) since Roe v. Wade was decided in 1973. Sorry, but a sigh and scare quotes aren’t enough to discredit a true statement. The things abortion kills are objectively, irrefutably human beings. What does society call it whenever human beings are killed out of selfish desire rather than self-defense? Murder. Some pointed out that Castorina’s comments were offensive both to women and the black community. As the surviving Dr. King says, “the truth is not racist.” Nobody is saying black women are intrinsically less compassionate for their children. It’s the industry we’re talking about—an industry whose employees have been known to agree to earmark donations specifically to kill black kids, contributing to a world where abortion does disproportionately kill black children. 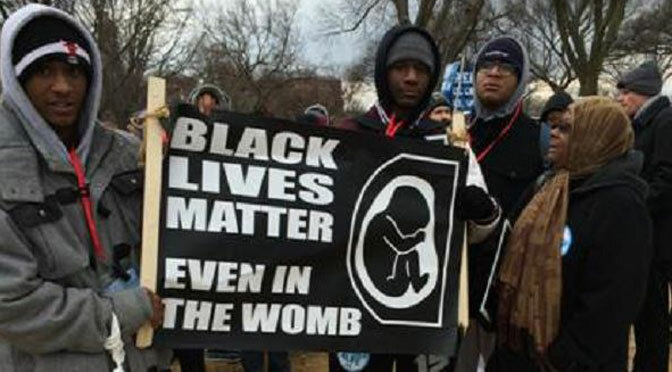 And again, there are a great many blacks, women, and black women who not only don’t think it’s offensive to discuss abortion’s disproportionate racial impact, but think denying it is the true offense. That’s the problem with trying to end conversations through the color of speakers’ skin rather than the content of their arguments: it’s only a matter of time before a dissenting opinion breaks the pattern. Silly me! Here I thought the point of opposing bigotry was that it’s wrong to make wild, generalized accusations against groups of people without evidence that a specific person does or doesn’t care about people’s lives. Thanks for clearing that up, Assemblyman Barron! Otherwise, I might have pointed out that the hypocrisy charge fits even better on his side, which endlessly declares “Black Lives Matter” while exterminating preborn black lives. There is real bigotry at work here, and the pro-abortion accusations of racism are nothing more than smokescreens to obscure it: excluding preborn babies from society’s understanding of personhood, pretending they’re something subhuman to rationalize their destruction. That the bigotry has taken root is the only reason anyone can get away with denigrating Assemblyman Castorina’s remarks as outrageous rather than obvious.